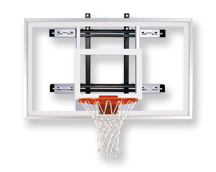 The Powermount Pro is the perfect side court wall mount basketball goal for a shooting station. Mounts just 12" from wall to save space, tempered glass feel for seamless transition from practice to play. The PowerMount Pro Wall Mounted shooting station is designed to allow backboard installations in tight spaces where playing area is at a premium. If your facility requires a backboard installation close to a wall, call on First Team PowerMount Wall Mount series! The PowerMount structure provides quick and easy installation of a basketball backboard on a wall with a minimal 12 inch of wall-to-backboard distance. The Powermount Pro comes with a mounting structure, silver support structure, 36"x60" Tempered Glass Backboard, heavy duty flex goal with nylon net. All PowerMount Wall Mount packages come with a manufacturers Limited Lifetime Warranty.